A high-quality vacuum cleaner will remove all dirt from hardwood floor cracks. This upright vacuum cleaner makes the list for its ability to wash and dry your hardwood floors quickly and efficiently. In other words, it combines vacuuming and mopping in a single vacuum cleaner model. This corded, bagless upright vac uses a 32-ounce cup for dirt collection, has a super-long 27 ft power cord length and a 13-inch wide cleaning path for good floor coverage. While its design is specifically for hardwood floors, it fares a bit on the heavy end, at almost 17 pounds, which isn’t ideal for some wood floors. However, it does use rubber wheels to move around without causing damage. Priced at around $155 on Amazon, this is the vacuum you want to buy if you want the convenience of a vacuum and mop in one to clean hardwood floor. A classic by Dyson, the V6 cordless stick vacuum is popular for the lightweight quality design that makes it easy to use anywhere. In contrast to the PowerEdge, the V6 excels at picking up finer dust and debris, like flour, which is why it makes this list. This one also comes with attachments and accessories, such as a crevice tool and dusting brush to help with more than just hard floor cleaning. Its flexibility allows for it to be used for cleaning tasks like drapes and other above-floor areas, making it an easy choice for homeowners with hard floors. Priced at $260, this cordless stick vacuum cleaner doesn’t hold much dirt and dust, as it has one of the smallest dust cups on this list, but you can’t expect much when it only weighs 4.5 pounds. What it lacks in features and effectiveness, it makes up for with Dyson’s top-notch customer support and care, and it’s extremely easy to maneuver. Further, you can always buy the V6 absolute, which comes with a handheld vacuum attached to the stick, if you need something with more features. One of the high-priced vacuum cleaners on this list, the Shark Rotator features a powerful motor and useful tools for cleaning more than just your hardwood floors. 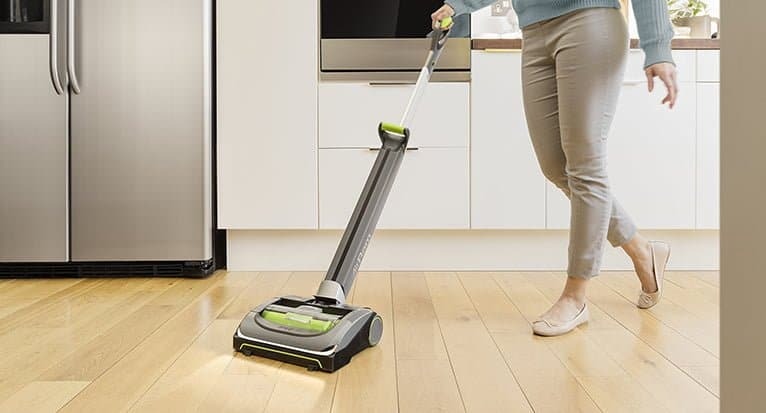 Weighing a solid 15.6 pounds and priced at a hefty $280, this floor vacuum should be worth the money simply because of its powerful motor, high suction power and its extras, including 30 feet of cord length. This comes with a lengthy warranty and features a large dirt cup, at 105.6 ounce. Plus, it has a HEPA filter for allergy sufferers. Finally, one of the top rated vacuum cleaners for hard floors is the Bissell Hard Floor Expert. Another canister vacuum floor cleaner for the list, some consider this one to be extremely effective at picking up fine dirt, dust particles and debris from wood floor. It conveniently allows you to adjust the suction and height settings, and features attachments and accessories to let you clean drapes and upholstery, too. It’s also extremely easy to use because its control buttons are situated on the handle, as well as on the base of the canister body. Priced at $119, this is the vacuum cleaner to buy for a total home cleaning appliance that can gently tackle your wooden floor without damaging them. Plus, with its powerful suction, it’s great for tile floors and any hard floor, as its name suggests. There are so many top rated vacuum cleaners on the market, like the Shark Navigator, which could have made this list if we made this one longer. However, a quick look at various vacuum reviews will reveal that there are many different types of vacuums, and not every one of them is a hardwood floor cleaner, specifically. Hope this list will serve as a guide, a comparison of the various product models to make buying a vacuum cleaner for hardwood easier.